Has anyone seem this sale at Verizon? How did we not know about this? 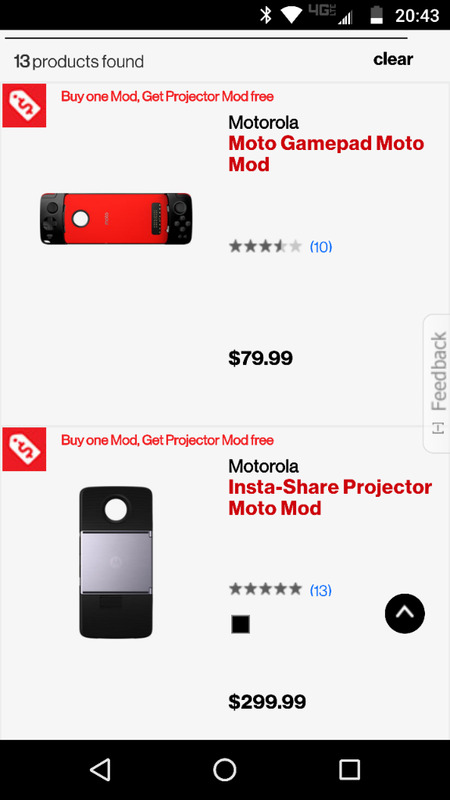 Buy any regular price Moto Mod and get an Instashare Projector for free. I just bought a Kate Spade battery Mod for $29.99 and got a $299.99 projector for free. Looks like supplies are running low and the projectors are already on "backorder". I'm OK with waiting until January for free stuff (well... almost free). I bought the moto z2 play on december 28th through best buy. Walked into my local verizon store to check out some mods. The rep there told me about this promotion. I thought maybe he was mistaken. Nope. Bought the moto battery mod for about $80 and walked out with a projector. I will say I am 100% impressed with it. It's really clear and crisp. My 2 boys love it. Very cool. Looks like there are some cool new Mods on the Horizon. A Keyboard Mod and a Health Mod. The keyboard reminds me of my first Moto Q PDA and the foldout keyboard that I used with it. Those are pretty cool! I think the health mod is awesome for folks with medical issues and the elderly. It would be nice if the price wasn't so steep. I'm trying to figure out if my fingers could work that keyboard. Sure looks cool... A teeny-tiny laptop-looking thing. Yeah, the Moto Q9m was my first smartphone loved it. This reminds me of the OG DROID a855. That was a Great phone back in the day. I still have it and it works fine. Just spent a half hour on the phone with Verizon today to get them to remove the $246.90, that they wanted to charge me for the "free" Insta-Share Projector, from my bill. The rep was very nice and thorough and got it taken care of. Hopefully, none of the rest of you have this issue. Whoa.... Glad you got it straightened out..
After talking with a CSR again about my items that I never received it got it straightened out. I have the 2 Kate Spade Style Mods coming and since they were sold out of the Tumi Style Mod as a Courtesy they are Sending me the Moto Power Pack Mod instead for the price of the Tumi Style Mod. I should be getting them all by Tuesday. Can't wait to try out the projector. Have a trip and figured I can test it out. For those that participated in the sale, check your bill. Even though Verizon assured me on 12/27 that their "estimated Bill" on the app & website were wrong, and I would not be billed $238 for the projector....I was. I am on the phone with them now, explaining the sale and explaining the confirmation e-mail I received showing the sale price + the (-) credit for a free Mod. It sounds like they are going to fix my Bill, but waiting on supervisor approval. Edit: My bill is fixed and corrected, the charge for the projector Mod was removed. I am OK with a short phone call to fix my bill for free stuff. Been there and done that. I hope that everybody pays close attention to their bill and calls dear sweet Verizon. I just got part of my order. The 3 free Projectors. The bill showed 0. Now to wait to see if the Power Pack was properly charged at 39.99 for me. I have a question for my fellow Moto Z owners (any Moto Z model) related to style shells. Many probably remember the gorilla glass style shell mods released earlier this year. At the time I decided that I would wait and buy one closer to the Z3 launch since I already have pretty much every other style shell. Silly me. I have looked periodically for a month and cannot find those glass style shell mods for sale anywhere. I should have bought one or two back then, I had no idea these would be a one time release and then gone forever. Has anyone seen any US shopping website where these things are for sale? If so, please let me know. Thanks.